This very interesting gull was photographed at Marine Lake this afternoon by Avon birder Paul Bowyer. 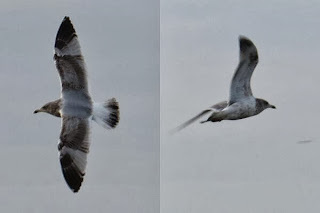 In every aspect, it seems to resemble a 2nd or 3rd winter NORTH AMERICAN HERRING GULL, with its heavy blotching on the underparts, extensively streaked head and tail pattern. However all we can do is look at the features and come up with our best evaluation. The adult-like inner primaries (incl. P5 with strong white tip) and most of the secondaries, and obvious mirror of P10 strongly suggest that this is a 3CY. There are dark marks in the tertials, but from these two images it is not possible to assess the degree to which they are black and/or sharp - and anyway I am not convinced that argen cannot show blackish and quite sharp marks in the tertials on 3CY birds. So unless the ID features have been refined since the publication of Lonergan and Mullarney 2004, I don't see how this bird could be called a Smithsonian's from these images.